Next is to copy the Certificate to the other store in windows. This has to be done for every computer that will be talking to PC Charge, Including the computer that has PC Charge On it. Now in the add or remove snap-ins window Click on Certificates then click ADD > in the middle of the window. Now in the Certificates snap-in window that popped up click finish. 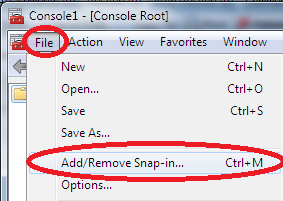 You will now be back to add or remove snap-ins window, Certificates should still be highlighted. Now click on the ADD> button but this time clicking on the Computer account button, Then Next > Do Not changing any other settings in the next window that popped up click Finish. The next few steps you will be working in the left side ONLY. Now in the Right panel Right click on PCChargeDefaultCertificate-CA select copy. Again this process has to be done for EVERY station that will be processing credit cards. Click File (at top Left)> logoff and minimize. Change server name or IP address to the computer that has PC Charge. If this is the only computer or the computer that has PC Charge on it, Leave set to localhost. Fill in the account number from the bottom of PC Charge, and also the 4 digit processor abbreviation. This does require additional user Licenses from VeriFone. Repeat The above steps on Each station that will be processing credit cards.